The documentary “A German Life” unsettles viewers by considering complicity in Nazism based on career choice. Directors Christian Krones, Olaf Muller, Roland Schrotthofer, and Florian Weigensamer raise disturbing questions on this topic through a very mundane Nazi. 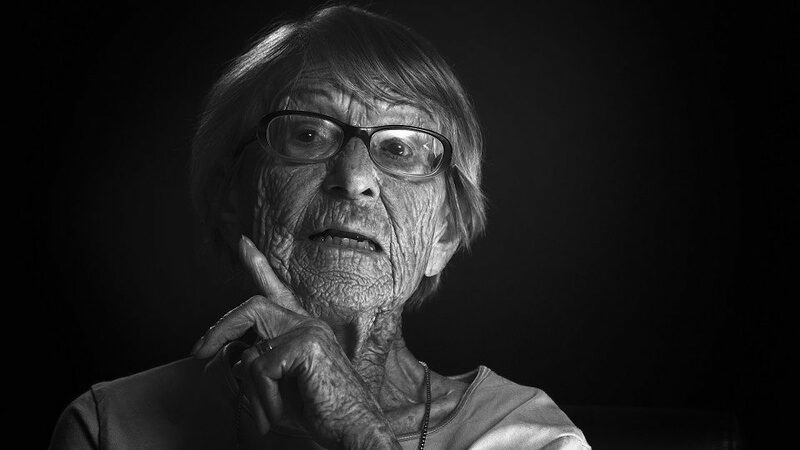 Subject Brunhilde Pomsel is a secretary who eventually became stenographer to Nazi propaganda minister Joseph Goebbels. Even at age 104, she clearly recalls a career path which took her from a Jewish lawyer’s offices to the inner circles of Nazi power. Clips from propaganda films offer ironic counterpoint to Pomsel’s recollections with their retrospectively naïve ideas about the poisonous appeal of the Nazi Party. Pomsel’s memories of the early Nazi rallies make clear that she wasn’t a racist ideologue. What mattered to her was that the Nazis paid far better than her other employers and they had nicer work environments. How culpable was Pomsel in Nazi atrocities? The camera constantly focuses on her weathered and lined face, hoping to determine if she’s lying when she says the higher-ups kept The Final Solution secret from the lower level employees. Yet no guilt or regret is ever discerned. The closest the film comes to establishing Pomsel’s own sins regarding her aiding the Nazis comes with the subject of Sophie Scholl. To the former Goebbels stenographer, Scholl’s involvement in the non-violent White Rose movement was ultimately a useless waste of a young life. Pomsel even glorifies her lack of curiosity regarding a confidential Nazi file on Scholl. The former Nazi clerk avoids taking the opportunity to trash talk her former employers. Her criticism of Goebbels as physically unprepossessing is tempered by her admiration of his spellbinding oratory. Life in Hitler’s bunker during the Reich’s final days is recalled as a personal alcoholic haze. Pomsel resents her imprisonment by the Russians as she did nothing morally reprehensible. Yet one thinks about her supposedly dear Jewish friend. Their relationship was not strong enough for Pomsel to have curiosity about her ultimate fate. Heidi Ewing and Rachel Grady’s entertaining documentary portrait “Norman Lear: Just Another Version of You” looks at the writer/producer who altered both television and American popular political discourse. Such Lear comedies as “All In The Family” and “Maude” entertainingly discussed controversial subjects such as abortion. Lear’s co-founding of People for the American Way helped challenge Religious Right authoritarianism. Ewing and Grady acknowledge Lear’s personal and professional shortcomings, but ultimately celebrate his long productive life. Neymann’s film takes a more somber tone by contrast. The hardscrabble existence of the Ukrainian shtetl’s inhabitants doesn’t get presented with sentimentality or melodrama. Yet village life still offers moments of odd humor. A photographer tries to set up the right and perhaps only shot of a street band in the midst of chaotic daily street life. Even a letter recounting relatives lost in a pogrom becomes an occasion for dark humor. Providing a dramatic focus for Neymann’s film are the child characters Shimek and Buzya. Shimek spins for neighbor girl Buzya’s benefit fantastic tales of adventure and magic. Buzya is entertained by Shimek’s fancies, but up to a point. The boy’s blind spot lies in his mistaking his fantasies for reality. A collapsing roof provides a satisfactory metaphor for the death of a tyrannical teacher. But Shimek’s fantasy of Buzya’s romantic attraction to him leads to unhappiness in the film’s final act. Neymann’s resolution of this plot thread lies more in finding visual metaphors than a dramatic seed for emotional resolution. Amit Cohen, creator of the Israeli television espionage series “False Flag,” tries negotiating a treacherous balancing act. Enough material must be provided to generate audience empathy for the series’ five main characters. Yet reasonable suspicions must also be raised about these same characters. The initial two episodes shown at the S.F. Jewish Film Festival demonstrates a failure to achieve such dramatic balance. Five ordinary Israelis with dual passports allegedly kidnap a prominent Iranian general from a Russian hotel. A police manhunt begins for a married chemist, an English tutor, a grade school teacher, a beach bum stud, and a bride-to-be. These “ordinary” Israelis do have secrets. But do any of those secrets relate to the general’s kidnapping? While setting up the drama, the series asks “Who do you trust and why?” Romantic relationships and professional relationships wind up being a far weaker basis for trust than viewers expect. Yet if those grounds for trust are lacking, what is a stronger replacement? The trust issue isn’t helped by the show’s misdirections. Seeing one suspect watching a military assault rifle being assembled proves more effective in raising doubt than later examples of that subject’s “guilt.” The script does a better job of springing sudden unpleasant surprises on the viewer. However, such surprises rarely succeed in pumping some dramatic adrenaline into the series. The character of the chief Shin Bet investigator does deliver a drily humorous line or two. But the schoolteacher character is so far underwritten. And despite the finale of the second episode, there seems little motivation to watch further and learn who implicated these five suspects in the kidnapping and why. CONFIDENTIALITY NOTICE: This document is intended for the use of the party to whom it is addressed and may contain information that is privileged, confidential, and protected from disclosure under applicable law. If you are not the addressee, or a person authorized to accept documents on behalf of the addressee, you are hereby notified that any review, disclosure, dissemination, copying, or other action based on the content of this communication is not authorized. If you have received this document in error, please immediately reply to the sender and delete or shred all copies.